갤러리이배는 2019년 4월 8일 아랍에미리트의 수도 아부다비에 위치한 Manarat Al Saadiyat에서 열리는 이머징 아티스트 아트페어인 <Galleries at MAS>에 참가하였다. 4월 8일 VIP오프닝을 시작으로 14일까지 열린 이번 아트페어는 2019 Culture Summit과 동시에 진행되어 세계 문화예술 관계자들이 대거 참석하였다. 한국 갤러리로는 유일하게 초대받은 갤러리이배는 뛰어난 작품성으로 우리나라를 대표하는 신진작가인 김은미, 김인지, 유화수 작가의 개성있는 작품을 세계 미술애호가 및 관계자들에게 소개하였다. 작년 Abu Dhabi Art의 성과에 힘입어 중동미술시장에 또 한번 한국작가의 우수성을 알리는 좋은 기회가 되었고 세계 문화관계자들로부터 큰 찬사를 받았다. 이번 전시는 올해 6월 4일까지 진행된다. 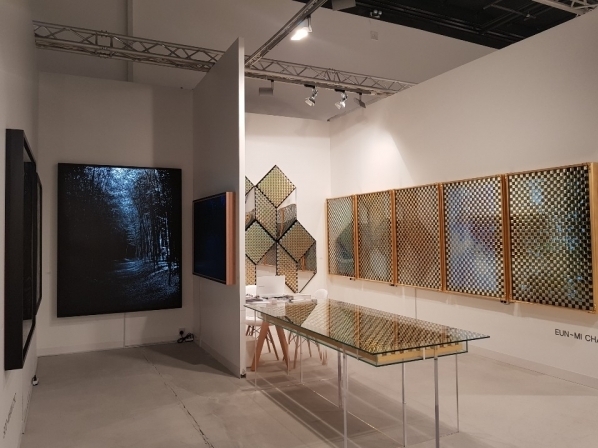 Galleries at MAS opened during the same week the influential gathering of Culture Summit which also took place at Manarat Al Saadiyat from 8-14 April 2019. Guests of the Summit are invited to view works in the gallery booths providing an opportunity for galleries to engage with a global, culturally influential group of over 250 curators, artists, journalists, archaeologists, diplomats and arts professionals who are all participating in the Summit. Galleries at MAS will then be open to the public for a further 3 days once the Summit ends, allowing networking for galleries with locally based collectors and a wider public. LEE & BAE is pleased to introduce three Korean emerging artists in Galleries at Mas. Eun-Mi Kim, Hwa-Su Yoo and In-Ji Kim who are building up their own art world, were very well-received by art lovers and enthusiasts. 갤러리 이배는 2019년 3월 26일(화)부터 3월 31일(일)까지 홍콩 센트럴 하버프론트(Central Harbourfront, Hong Kong)에서 개최되는 2019 아트 센트럴(Art Central 2019)에 참가하였다. 세계적인 아트페어인 아트 바젤 홍콩(Art Basel Hong Kong)의 가장 주목받는 위성 아트페어인 아트 센트럴(Art Central)은 센트럴 하버프론트의 대형 텐트에서 열리는 아트페어로 아트홍콩 설립자인 샌디 앵거스와 팀 에첼스가 젊고 실험적인 예술가들을 집중적으로 소개하기 위해 2015년에 출범시켰다. 올해로 제 5회를 맞이한 아트 센트럴은 110여개의 국내외 화랑들이 참가하였으며, 일반대중 및 미술애호가들에게 참신하고 캐주얼한 작품들과 다양한 퍼포먼스 이벤트를 통해 새로운 작가들을 접할 수 있는 기회를 제공하고 있다. 갤러리 이배는 그 동안의 기획전시 및 아트페어 참가를 통해, 새로운 시도로 자신만의 작품 세계를 구축해가고 있는 배상순(회화) 과 이탈리아의 조각가 피터 데메츠의 회화적 조각을 출품하여 세계 미술애호가들로부터 큰 호응을 받았다. LEE & BAE participated in <Art Central 2019> which opened at Central Harbourfront, Hong Kong from the 26st to the 31th of March, 2019. Art Central is the best satellite art fair of Art Basel Hong Kong in a large tent on the Central Harbourfront. Tim Etchells and Sandy Angus launched the Art Central to introduce young and experimental artists in 2015. Art Central celebrated their fifth anniversary this year. 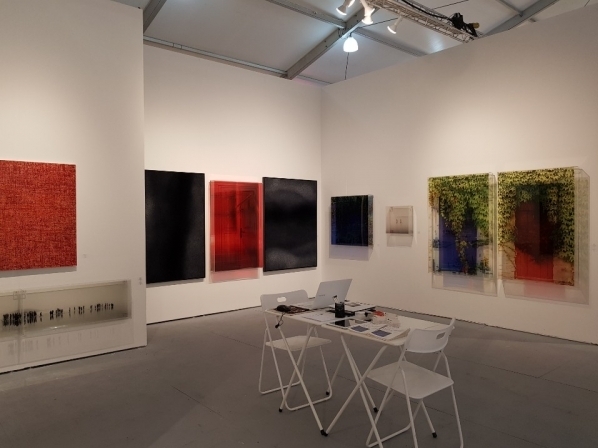 More than 110 domestic and overseas galleries showed original and casual artwork, through different performance events and provided an opportunity for the general public and collectors to meet new and creative artists and their artworks. 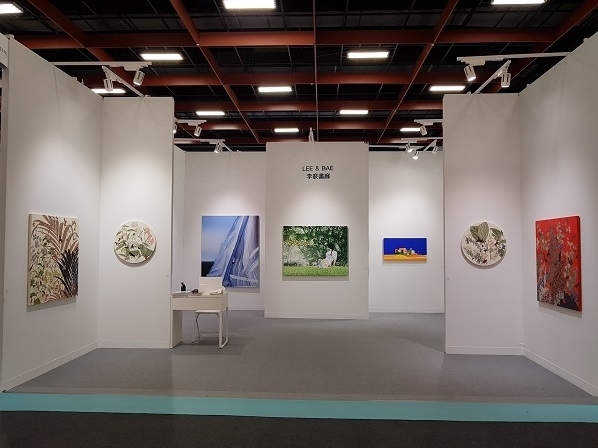 Through participating in exhibitions and art fairs, LEE & BAE had a two men show, including Sang-Sun Bae(painting) and Peter Demetz(Sculpture) who are building up their own art world, LEE & BAE was very well-received by art collectors and enthusiasts. 갤러리 이배는 2019년 2월 21일(목)부터 2월 24일(일)까지 서울 코엑스에서 개최되는 2019 화랑미술제에 참가하였다. 한국 최초 아트페어인 화랑미술제는 1979년을 시작으로 올해로 37회째를 맞이하며, 한국화랑협회 소속의 각 회원화랑들이 대표 작가들의 우수하고 미술작품들을 선보이는 미술품견본시장이다. 올해는 역대 가장 많이 참여하는 111개 갤러리들이 모여 일반 대중들에게는 미술향유의 기회를 제공하였으며, 미술애호가들에게 각 화랑 대표작가의 참신한 작품을 구입할 수 있는 좋은 기회를 제공하였다. 갤러리이배는 전통방식의 청화안료를 현대적으로 구성하여 회화적 중국도자의 색다른 면모를 보여주는 후하이잉 작가의 ‘Between Landscape’ 연작들을 선보였다. 도자회화 분야의 신예작가 단독 전시로 이루어진 이번 전시는 미술전문가들의 관심을 집중시켰으며 한국 콜렉터로부터 큰 호응을 받았다. 갤러리 이배는 2018년 12월 6일부터 12월 9일까지 미국의 플로리다주 마이애미의 Indian Beach Park에서 개최되는 Pulse Miami 2018에 참가하였다. Pulse Miami는 2005부터 시작해 올해 13회를 맞이하였으며 현재 미국을 이끌고 있는 세계적인 컨템포러리, 모던아트 페어로 국내외 75개의 갤러리가 참가 하였다. 갤러리 이배에서는 아크릴이라는 재료와 다양한 이미지를 사용해 작업을 시도하는 허미회작가의 사진조각과 교토를 중심으로 활동하는 배상순작가의 사진과 회화작품과 더불어 일본의 요코미조 미유키작가의 설치 및 회화작품을 출품했다. 출품된 작품들은 미술애호가와 미술품 컬렉터로부터 좋은 반응을 얻었으며 한국 작가들의 국제적 위상을 고취시키는 데 큰 기여를 했다. LEE & BAE participated in <Pulse Miami 2018> which opened at Indian Beach Park, Miami, Florida, USA. Starting from 6th to the 9th, December, Pulse Miami 2018 celebrated 13th opening with 75 local and international galleries. Pulse Miami is well known as one of the America's leading international contemporary and modern art fair. This year LEE & BAE displayed artworks of three different artists: Her Mi-Hei(Photo Sculpture), Bae Sang-Sun(photo, painting), and Miyuki Yokomizo(Sculptural Painting). 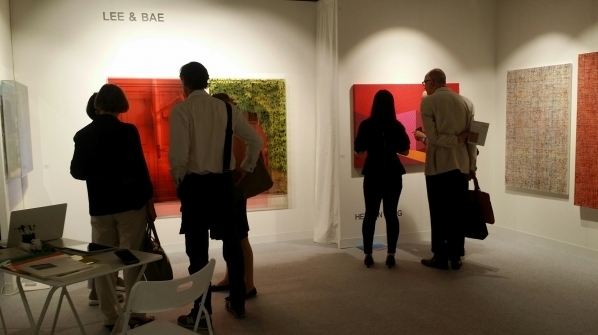 LEE & BAE was well-received by art collectors and enthusiasts. 갤러리 이배는 2018년 11월 14일부터 11월 17일까지 아랍에미리트의 수도 아부다비 Manarat Al Saadiyat에서 개최되는 Abu Dhabi Art 2018에 참가하였다. 문화예술 특구를 목표로 하는 사디야트 섬에서 진행된 Abu Dhabi Art 2018는 올해로 10주년을 맞이하여 루브르 아부다비를 비롯하여 세계 최대의 미술관 프로젝트 진행 현장을 배경으로 펼쳐진 다양한 전시회 프로그램들로 축제 분위기에서 진행되었다. 갤러리 이배는 골드큐브와 자개로 현대적 조형성을 보여주는 채은미 작가와 점과 구멍으로 빛의 경로를 만들어 과학과 미술의 결합을 시도하는 최수환 작가의 작품들을 선보여 세계미술인과 컬렉터로부터 열광적인 호응을 얻었다. 중동예술의 메카로 부상하는 아부다비에서 한국 미술의 저력을 보여준 아주 뜻 깊은 행사였다. LEE & BAE participated in <Abu Dhabi Art 2018> which opened at Manarat Al Saadiyat, Saadiyat Cutural District, Abu Dhabi, UAE, starting from 14th to the 17th, November, 2018. Abu Dhabi Art 2018 was in the Saadiyat island, which is the Abu Dhabi’s new art and cultural zone, with the world widest art museum projects, composing of various programs and highly uplifted the art fair, including Abu Dhabi Louvre and Guggenheim Abu Dhabi. LEE & BAE showed artworks of two outstanding Korean artists: Eun-Mi Chae, who makes a modern modeling using golden cube and mother-of-pearl; Soo-Whan Choi, combining art and science using the smallest, delicate dots to penetrate light. By presenting artworks of two artists who will lead the next generation of global art world, LEE & BAE was very well-received by art collectors and enthusiasts. 갤러리 이배는 2018년 10월 25일부터 10월 29일까지 Taipei World Trade Center에서 개최되는 ART TAIPEI 2018에 참가하였다. 올해로 25회를 맞이하며 아시아에서 가장 오랜 역사와 전통을 자랑하는 ART TAIPEI에서 현실과 비현실의 경계를 몽환적으로 표현하는 이우림(회화), 자신만의 유토피아적 '가상세계'를 표현하는 유화수(회화), 자연 풍경을 통해 초현실적인 공간을 표현하는 김지선(회화), 감각적이고 강력한 색채을 지닌 다이내믹한 에너지를 그리는 류제비(회화) 작가의 작품들을 선보여 미술품 컬렉터로부터 좋은 반응을 얻었다. LEE & BAE participated in <2018 Art Taipei> which opened at World Trade Center, Taipei, Taiwan, starting from 25th the VIP preview opening and 26th to 29th, October, 2018. Art Taipei is oldest one of art fair in Asia where all the major art collectors of Asia, including Taiwan, Japan, China, Hong Kong, Korea and etc. as well as the industry participants gather together and this year total 114 galleries from 12 different countries participated. In Art Taipei 2018 LEE & BAE showed artworks of four different painting artists: Woo-Lim Lee, Jae-Be Ryoo , Hwa-Su Yoo and Ji-Seon Kim. By presenting artworks of four artists who will lead the next generation of global art world, LEE & BAE was well-received by art collectors and enthusiasts. 갤러리이배는 2018년 10월 3일 VIP 프리뷰를 시작으로 10월 7일까지 서울 코엑스 A&B홀에서 개최되는 KIAF 2018 | ART SEOUL에 참가했다. KIAF ART SEOUL은 세계적 주요 컬렉터들과 미술 관계자들이 한자리에 모이는 아시아 최대의 아트마켓으로 올해 14개 국가, 총 174개의 갤러리가 참가하였다. 이번 KIAF 2018 | ART SEOUL에서는 신선한 디자인을 새롭게 적용하여 KIAF의 정체성을 부각시켰으며 개성 있는 갤러리 부스와 함께 다양한 볼거리를 제공했다. 갤러리이배는 한국적 미감으로 유럽을 감동시킨 조형예술작가 허미회, 세계적으로 활동하는 도자회화작가 이승희를 비롯하여 이탈리아의 조각 거장 피터 데메츠, 그리고 교토를 중심으로 활동하는 배상순작가의 사진과 회화작품을 출품했다. 갤러리이배는 심도 깊은 철학적 배경과 탄탄한 실력으로 무장한 위 작가들의 작품들이 한국 미술사에 새 지평을 이끌 것을 확신하는 동시에 미술애호가와 미술품 컬렉터로부터 좋은 반응을 얻었다. LEE & BAE participated in <KIAF 2018 ART SEOUL> which opened at A&B Hall Coex, Seoul, Korea, starting from 3rd the VIP preview opening and 4th to 7th, October, 2018. 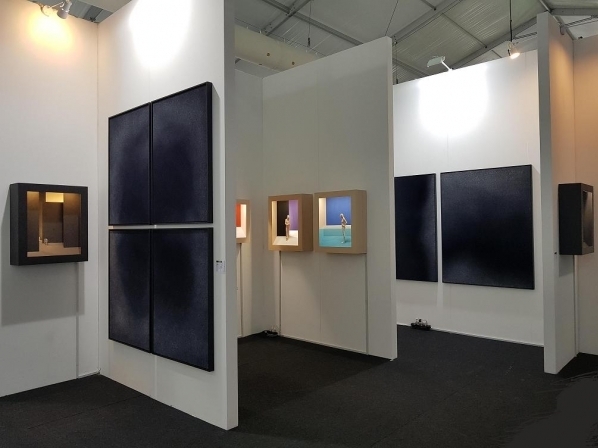 KIAF ART SEOUL is one of the biggest art market in Asia where all the major art collectors as well as the industry participants gather together and this year total 174 galleries from 14 different countries participated. KIAF 2018 ART SEOUL applied new designs to accentuate KIAF’s identity, providing different attractions and diversity. LEE & BAE displayed artworks of four different artists: Her Mi-Hei, plastic art artist who fascinated Europe with the esthetic sense of Korea, global ceramic artist Lee Seung-Hee, Peter Demetz, a great sculptor from Italy, and Kyoto based Bae Sang-Sun(photo, painting). By presenting artworks of four artists who will lead the next generation of global art world, LEE & BAE was well-received by art collectors and enthusiasts. 갤러리이배는 2017년 6월 21일(목)부터 25(월)까지 부산 벡스코에서 개최되는 2018 BAMA 부산국제화랑아트페어에 참가하였다 부산국제화랑아트페어는 2012년 첫 행사를 시작으로 올해로 7회 째를 맞이하는 부산 및 경남 일대 최대의 아트페어이다. 올해 부산국제화랑아트페어에서는 서울, 경남, 대구, 경북 등 전국 단위와 해외 화랑들을 포함하여 100여개의 화랑들이 참여하여 규모와 질적인 성장을 이루었다. 갤러리이배는 국내외적으로 작품성을 인정받고 한국과 일본에서 활동하는 허미회(사진조각), 요코미조 미유키(회화, 설치), 배상순(회화) 등 중견 여성작가 3인의 작품 24점을 선보였다. 갤러리이배는 심도 깊은 철학적 배경과 탄탄한 실력으로 무장한 위 작가들의 작품들이 한국 미술사에 새 지평을 이끌 것을 확신하는 동시에 미술애호가와 미술품 컬렉터로부터 좋은 반응을 얻었다. LEE & BAE participated in <2018 Busan Annual Market of Art> which opened at Bexco, Busan, Korea from 21th to 25th, June, 2018. BAMA is a noteworthy global art market in Busan which started at 2012. 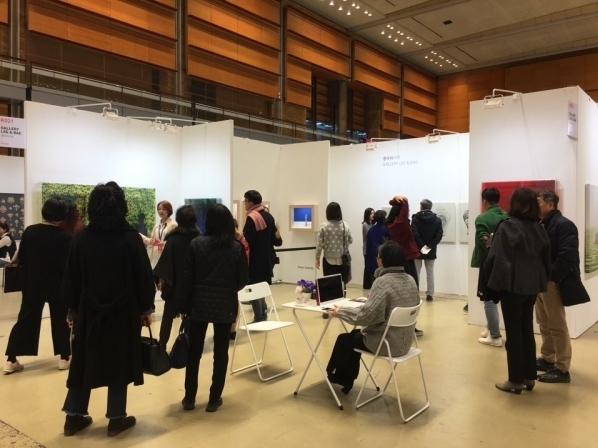 Around 100 galleries from all parts of the Korea such as Seoul, Gyeongnam, Daegu, Gyeongbuk, etc to foreign country took part in the art fair this year and proved its growth in terms of scale and quality. LEE & BAE displayed artworks of three excellent woman artists: Kyoto based Bae Sang-Sun(Painting), Seoul based Her Mi-Hei(Photo Sculpture), Kyoto based Miyki Yokomizo(Sculptural Painting). They are already recognised in global art world and art market. Her Mi-Hei was successful in Volta 14, Basel, Swiss this year. Bae Sang-Sun and Miyuki Yokomizo's works get attention with philosophical depth and labor oriented aspects. By presenting artworks of bright woman artists who will lead the next generation of global art world, LEE & BAE was well-received by art collectors and enthusiasts. 갤러리 이배는 2018년 6월 11일(월)부터 6월 11일(토)까지 스위스 바젤에서 개최된 아트 VOLTA 14 아트페어에 참가했다. 2005년 출발한 VOLTA14는 Art Basel기간에 동시에 개최되는 위성아트페어로서 수준 높은 갤러리의 참가와 작품성으로 매우 인정받고 있으며 유럽 전역에 걸쳐 견고한 콜렉터층을 구축하고 있다. 갤러리이배는 세계적인 아트페어로서 면모를 갖춘 VOLTA 아트페어에 선정되어 한국의 허미회(사진조각), 장희진(회화) 작가, 그리고 일본의 미유키 요코미조(설치 및 회화)작가의 작품을 출품했다. 출품된 작품들은 스위스 및 유럽 콜렉터의 큰 사랑과 호응을 받았으며 이본 전시 참여로 갤러리이배는 한국 작가들의 국제적 위상을 고취시키는 데 큰 기여를 했다. VOLTA, Basel's art fair for new international positions, debuted in 2005 as a collaboration between dealers and friends. The aim was to secure a platform for international galleries beyond young art stalwart Liste and market heavyweight Art Basel. Concerns and aspirations of the exhibiting gallerists have been first and foremost since VOLTA's inception; in combination with the curatorial mind of Artistic Director Amanda Coulson, eclectic and dynamic presentations with a strong focus on solo presentations find a stage as refined as at the main fair. GALLERY LEE & BAE participated <VOLTA 14> opened in Basel, Swittzerland at Elsasserstrasse 215 from 11th to 16th of June, 2018. Renowned as one of the Europe's leading international contemporary and modern art fairs, VOLTA 14 showcases an array of iconic and exemplary works, dynamic projects and special installations from more than 70 international galleries from over 22 countries. As one of the top ranked international art fairs for attendance in the Swiss attracts new and established collectors, curators, museum professionals, members of the press and art world luminaries annually. GALLERY LEE & BAE had great success with promotion for 2 excellent Korean artists and one Japanese artist as following: Her Mi-Hei, Jang Hee-Jin and Yokomizo Miyuki. 갤러리 이배는 2018년 2월 28일(수)부터 3월 4일(일)까지 서울 코엑스에서 개최되는 2018 화랑미술제에 참가하였다. 한국 최초 아트페어인 화랑미술제는 1979년을 시작으로 올해로 36회째를 맞이하며, 한국화랑협회 소속의 각 회원화랑들이 대표 작가들의 우수하고 미술작품들을 선보이는 미술품견본시장이다. 올해는 역대 가장 많이 참여하는 101개 갤러리들이 모여 대중들에게는 미술향유의 기회를 제공하였으며, 미술애호가들에게 각 화랑 대표작가의 참신한 작품을 구입할 수 있는 좋은 기회를 제공하였다. 갤러리 이배는 각 장르별로 기획전시 및 아트페어 참가를 통해 좋은 평가와 긍정적인 반응을 받았던 도자회화라는 새로운 장르를 구축한 이승희(도자회화)를 비롯하여, 현실과 비현실의 경계를 몽환적으로 표현하는 이우림(회화), 아크릴이라는 재료와 다양한 이미지를 사용해 자기 자신과 유희하는 작업을 시도하는 허미회(사진), 정교한 나무 조각으로 나무에 생명을 불어넣는 작가로 잘 알려진 이탈리아 조각가 피터 데메츠(조각) 작가의 작품을 출품하여 미술전문가들의 관심을 집중시켰으며 콜렉터들로부터도 큰 호응을 받았다. GALLERY LEE & BAE participated in <Korea Galleries Art Fair 2018> which was held at the Coex, Seoul, Korea from the 28th of February to the 4th of March, 2018. Korea Galleries Art Fair is the first art fair of Korea that started in 1979 and was celebrating their 36th anniversary this year. The members of Korea Galleries presented their representative artists' artworks. The 101 participating galleries had opportunities to show excellent artworks to collectors this year. 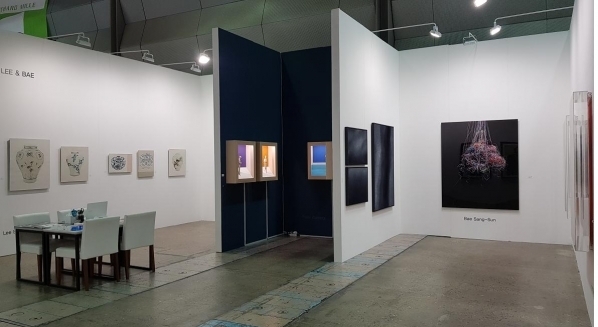 GALLERY LEE & BAE displayed artworks of artists who received a favorable evaluation and an affirmative response in special exhibitions and art fairs. We showed sophisticated pieces from, ceramic artist Lee Seung-Hee who opened a new horizon of the world, painter Lee Woo-Lim's artworks which to express the dreamy boundary between reality and unrealism, photographer Her Mi-Hei's artworks who is using the interplay between the acrylic box and various images, world class sculptor Peter Demetz who has eleven new pieces, which are continuing historical traditions and craftsman techniques. They have received a great response from art experts when submitted to the art fair.